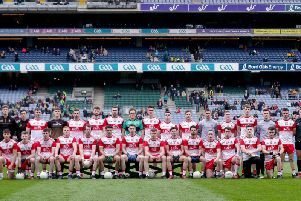 Derry are staring Division Three in the face after Cork all but secured their Division Two status with an impressive four point vicotry in Celtic Park on Sunday. Corner forward Colm O'Neill was the star of the show. After hitting 0-09 against Meath the previous week, O'Neill went two better with a personal tally of 0-11 as Derry defensive fragility cost them once more. It was just the start Derry wanted but from there the wheels came off slightly as the home side struggled with their own kick-outs. with O'Neill tagging on two further points, one a free, as the game was played almost exclusively inside the Derry 45. A lovely Danny Tallon score showed Derry's attacking prowess when they finally lifted the siege and McKaigue against showed his value with a run and fisted point. a superb Carlus McWilliams pass out from the back then set Enda Lynn free to tie the game at 0-4 points a-piece with a lovely score off the outside of his boot. Paul Kerrigan edged Cork back in front and when Niell Keenan fouled O'Neill, the Ballyclough forward had fourth point from the free for a 0-6 to 0-4 lead. And the two point lead could have been better. Full forward Peter Kelleher did well to turn Rogers and set himself through on goal but with defenders closing, the Kilmichael man saw his fierce shot cannon off the pots, albeit above the cross bar. A Benny Heron free brought it back to a single point game before a worrying injury for Jason Rocks, making his first league start for Derry, saw the game held up for 17 minutes. The game restarted with Derry finally managing to punch a hole in the Cork defensive unit and they took full advantage. Enda Lynn made the break from midfield and picked out Emmett McGuckin with a delighteful pass. The Magherafelt forward, turned and perfectly found Danny Tallon joining the move at pace from the right, the young Glen man smashing a superb shot past Ken O'Halloran for a 1-05 to 0-07 lead. Cork responded well though, three points from the talismanic O'Neill ( including two frees) restoring the Leesiders two point cushion only for a Benny Heron free to finally bring a half that ran to 52 minutes to a close with one point between the sides. The second half saw the home side step up the intensity of the tackle but even two defenders couldn't stop O'Neill's brilliant left footed score which got the second half scoreboard moving. It was cancelled out by an equally superb individual effort off the inside of the post from Steelstown's Neil Forester for 1-07 to 0-11. O'Neill was at it again from a '45' before corner forward Paul Kerrigan showed he wasn't about to be upstaged with two lovely scores but when O'Neil stepped forward to stroke a '45' over the bar like it was a 10m free, Cork had a three point advantage at 1-09 to 0-15. The home side introduced Mark Lynch and it paid dividends almost immediately as Lynch's set Danny Heavron away down the left. Heavron looked to have little on but got his head up and produced a superb ball across the face of goal which found Tallon lurking at the back post from where he tapped home his second goal of the game to tie the scores. Cork didn't panic though, Mark Collins and substitute Barry O'Driscoll rebuilding a two point lead before an outrageous O'Neill '45' from the touchline put them three ahead. Kerrigan tagged on another with his fifth of the day and suddenly from a position of optimism, Derry were staring at defeat. Eight second half wides didn't help the home cause but not for the first time this season a healthy return in the attacking zone was negated by a failure to close the opposition down. O'Neill was the difference. Superb throughout, this performance should take care of any last day nerves Cork manager Peader Healy may have had but Damian Barton and Derry are facing a tense battle in Fermanagh next week.